I’ve done this thing a few times that I call “Pennyfind.” I even have a category for it here. It happens when I come across a penny on a sidewalk or in the street or some unusual place. Being a superstitious sort, I usually pick it up and take a look at the year stamped on the penny. If it gives me an idea about something, I’ll put it into a blog post, because that’s where my random thoughts find their way into the world. Toady’s penny, which I found waiting for me in the street this afternoon after parking my car, had the most important year of all stamped on it: 1968. Many times I’ve referenced 1968 in this blog, because I was born just about in the middle of it, on a Friday in June.If I ever have a gravestone, or I’m important enough to have the years of my birth and death printed in parentheses after my name someplace, 1968 will forever be the first half of this pairing. So I better well have something to say about it here. 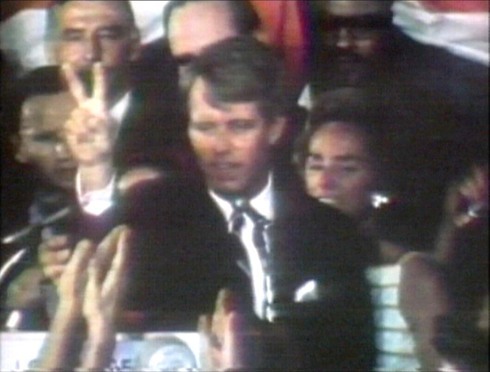 In 1968, Martin Luther King was killed in April, and Bobby Kennedy was killed in June. There were riots in Chicago and many other cities. I’ve seen pictures of cops swinging batons, and National Guard units patrolling the streets, and it looks like another world because, in lots of ways, it was another world. The world didn’t know about personal computers, the internet, emails, cell phones, and all kinds of other things that we take for granted today. Cars were big and bulky, running on gasoline that had lead in it. You could buy Unleaded gas, but it cost more so most people just used “Regular” gas instead. The factories that are now shut down and sitting empty were all operating back in 1968. Things were actually made in this country, from the shirts on our backs to the shoes on our feet to the baseballs that are used on the playing field. When I was a teacher, nearly 20 years ago, I confidently offered straight As for the entire year to any student who was wearing American-made shoes, an American-made shirt, and an American-made backpack. I never had to pay out on this though, because none of my students ever had so much as one of these American-made items. In 1968, there were precious few career paths available to women. I’ve spoken with some of them, who told me the options for working women were teaching or nursing, and nothing more than that. As shocking as that was, I’m happy that my daughters will have career choices that my mother simply didn’t have when I was born. In 1968, race was a defining feature in American society. It still is, and it probably always will be, but the idea of an African American in the White House would have been farcical on the day I was born. And yet here we are. Racism and discrimination still exist, but the color of a man’s skin is no longer a bar to the highest office in this nation. So many other changes have come in the course of my lifetime: Pay phones (of the rotary dial variety) once were everywhere, and now it’s almost impossible to find one, especially when you need to make a phone call. Laws against smoking indoors, even in hospitals, were unheard of. The Stonewall riots in New York were still a year in the future. Douglas Englebart invented the computer mouse, and Start Silver discovered the weak adhesive that, many years later, would be turned into Post-it notes. And Starbucks, possibly my favorite brand name of all, was still three years away from opening its first shop in Seattle. It’s amazing how much change has come during my lifetime. The second of my two incomplete years–the one that will complete my lifespan inside the parentheses following my name–hopefully hasn’t been stamped onto a penny just yet. I likely won’t write very much, if anything, about that year. So I’ll just make up it by writing about 1968, instead. Peace to all those who began their life’s journey in such an important year.